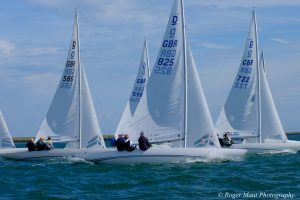 Twelve boats competed for the 2018 BDA East Coast Championship hosted by the Royal Corinthian Yacht Club, Burnham on Crouch on the weekend of 15/16 September; the last of the British Dragon Association 2018 regional championships. Under the stewardship of PRO Edwin Buckley and his team on ‘Phoebe’, six scheduled races were completed in a variety of conditions. Race One saw Ian Gray and his crew of Alex Burnett and Rene Nel in ‘Scorpio’ establish an early lead and take the first bullet. 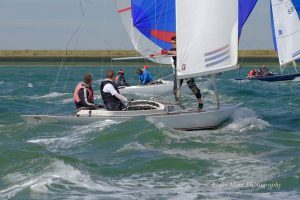 ‘Ganador’ with Martin Makey on the helm, Tim and Teresa Wilkes crewing, showed a great turn of speed to win Race Two before team ‘Avalanche’ Mark, Mandy and James Wade won Race Three. 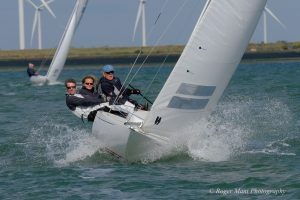 The overnight leader, without a race win, was ‘Beauty and the Beast’ steered by RCYC Commodore, Peter Marchant, with crew Katie Cole and James Howard, counting two third places and one second place. 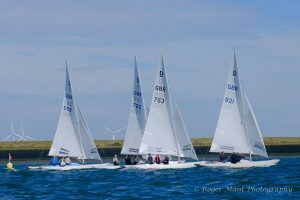 Sunday’s first race, Race Four in the series, was well won by Chip Cole, David Smith and Rob Drumgold on ‘Anarchy’, keeping them very much in the hunt for the overall win with ‘Avalanche’, ‘Scorpio’ and ‘Beauty and the Beast’. The intensity of competition turned up a notch for Races Five and Six and it was the battling Wade family in ‘Avalanche’ who got the better of ‘Anarchy’ in Race Five to record their second race win, before going on to hound a determined ‘Beauty and the Beast’ downwind in race six. Although ‘Beauty’ held off that challenge to win the race, the second place for ‘Avalanche’ was enough to take the championship from ‘Beauty’ by a single point, with ‘Anarchy’ one point further back in third. ‘Avalanche’ also retained the Corinthian trophy they won in 2017 ahead of ‘Anarchy’ in second and ‘Ganador’ in third. Race winners, and a few lucky others, received beanies and neck gaiters kindly donated by Essex Embroidery and Print – useful as the season in Burnham continues deep into November. Petticrows, the leading builder of International Dragons globally, opened the doors to their workshops on Saturday evening to show off the latest V6 Dragons in production and reveal a few details of how they make a thoroughbred racing yacht. Events like these do not happen without a huge contribution from a team of volunteers who run craning in/out, competitor registration, race management, mark laying and trophy presentation. 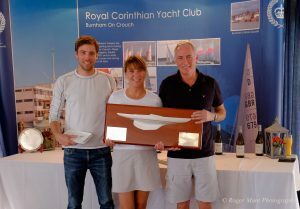 During the prize giving, the fleet showed their appreciation to all those that helped make the weekend a success including the popular and professional team at the Royal Corinthian Yacht Club.